Powerful workstations which are intended for professional use should also be able to impress with a high level of reliability, quality and functionality. Business tasks should be performed quickly with a high level of quality without having to deal with distractions such as compatibility issues. 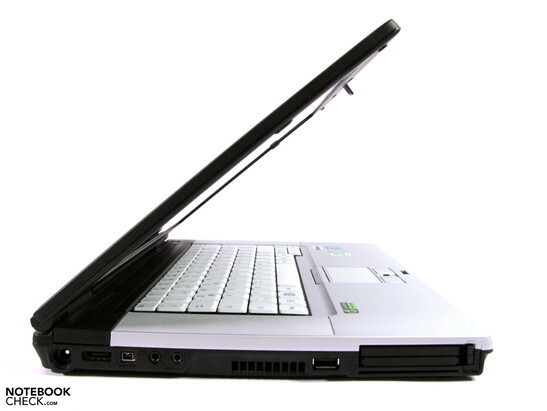 Besides the actual performance, factors such as ergonomics and expandability may not be considered an afterthought. 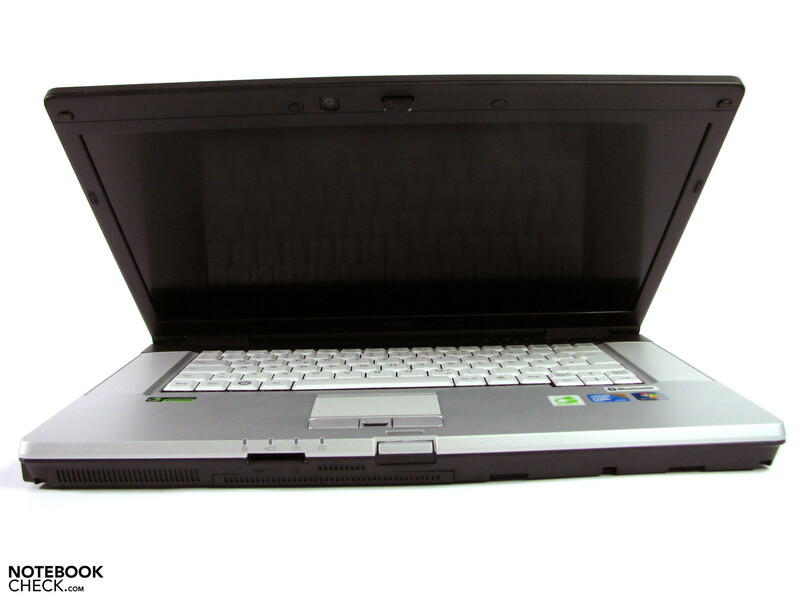 Computers which are used on a professional level are generally subjected to intensive use. In this case, poor ergonomics can lead to a reduction in the users work performance. Also the relatively long life cycle of such hardware within an organization (usually 3 years), requires a good level of compatibility with both newer and older hardware that may be used at the same time. 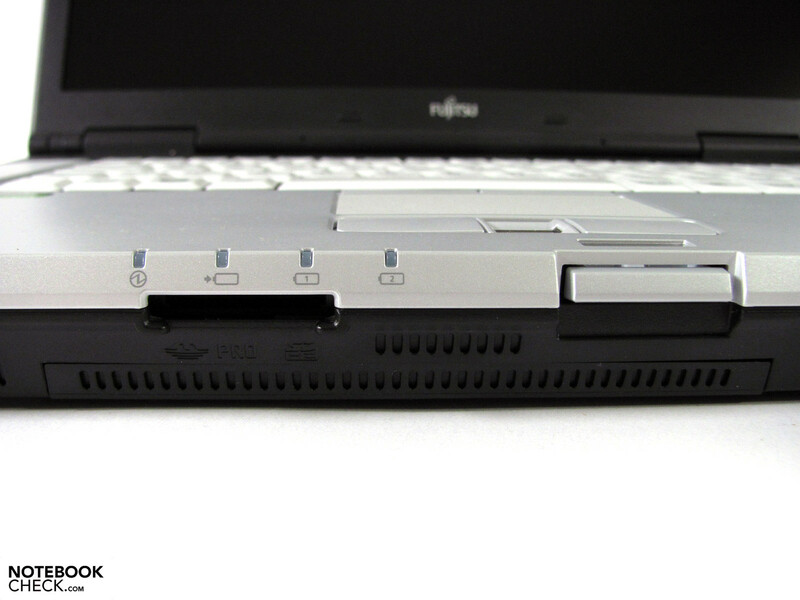 Fujitsu has made the very attractive price of this configuration its unique selling point when compared to competitors such as Lenovo (Thinkpad W510), Dell (Precision M4500) and HP (Elitebook 8540w). 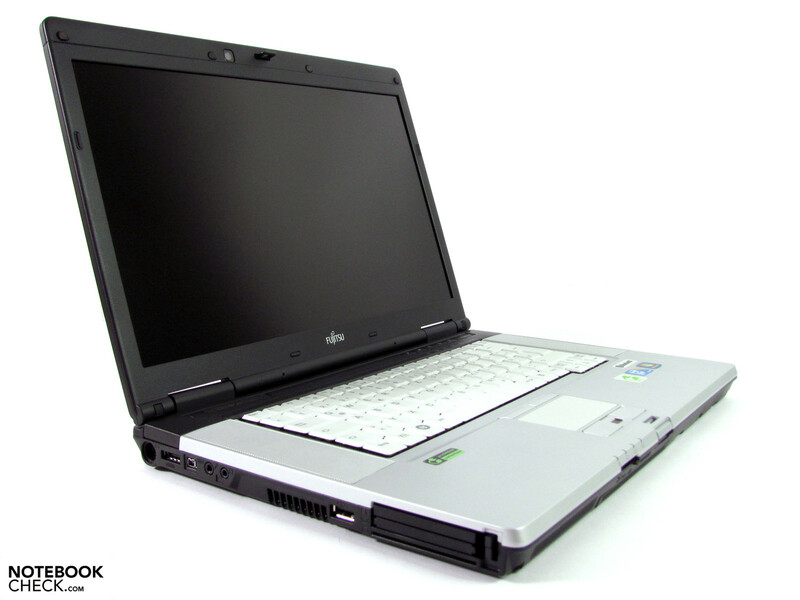 As mentioned earlier, our test unit is equipped with an Intel Core i7-620M, Nvidia Quadro FX 880M, 2 GB DDR3 RAM, 320 GB hard drive and a Full HD display. With a current starting price of less than 1500.- Euro, Fujitsu manages to make an offer several hundred Euros below that of the competition, which may tip the scales in its favor. The next step up offers a Core i7-820QM, 4 GB RAM, 500 GB hard drive, Blu-Ray and UMTS for about 2100.- Euro. The top of the line comes with 8 GB RAM pre-installed and will set you back a hefty 3200.- Euros reflecting the current market prices for RAM chips. Let's be honest. At first glance, this case is a bit of a disappointment. Anyone who has handled a Lenovo Thinkpad W510 or HP Elitebook 8540w will get the impression that this laptop is rather cheap. In some places, the plastic which has been used reminds one of a chewing gum dispenser and not a tool for professionals. This becomes most apparent with the bright surfaces found on the switches of the wireless module and display latches. On the other hand, it does defy convention with its two tone color scheme which also gives the casing a sleek appearance. If one can bring oneself to take a second look, it doesn't take long to realize that first impressions are not always what they seem. 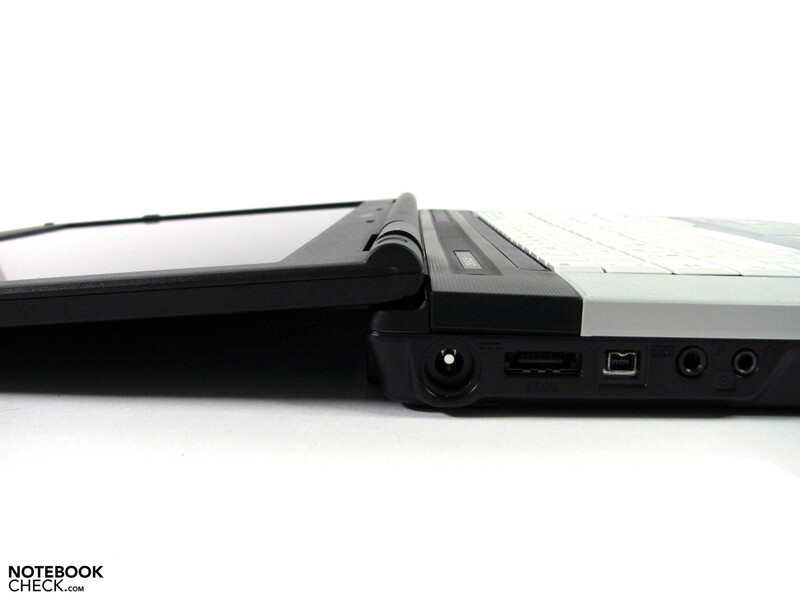 The palm rest, keyboard and base unit are very stable and cannot be pressed inwards or distorted in any way. The frame around the display is quite warp resistant and only allowed for a small amount of distortion allowing it to fulfill its protective role without any hesitation. The display hinges are quite alright, but cannot prevent the screen from wobbling when on an unstable surface. 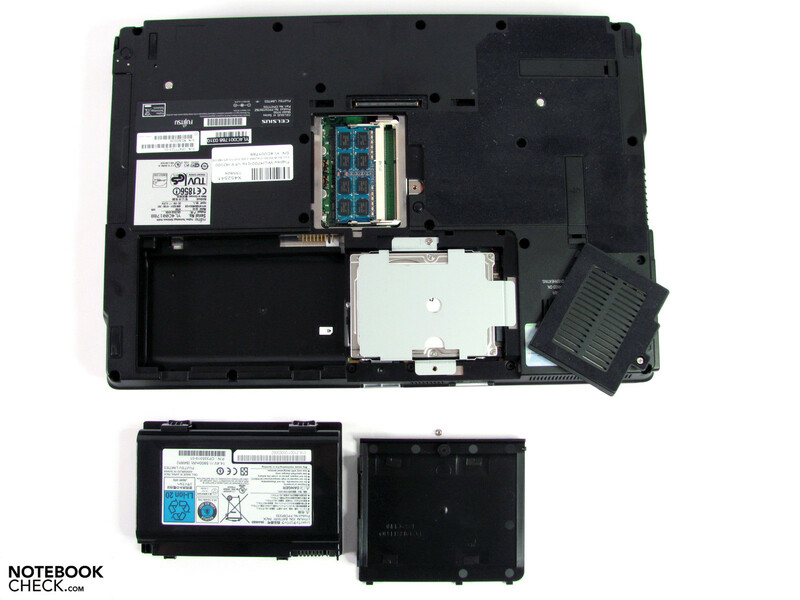 Underneath the laptop one can find various removable covers which conceal various components such as the hard drive, RAM and the unusual, square battery. We could not find any faults here either with all components being easy to access and well assembled. The front mounted battery has the additional advantage that the resulting weight distribution makes it easy to open and close the display with just one hand. 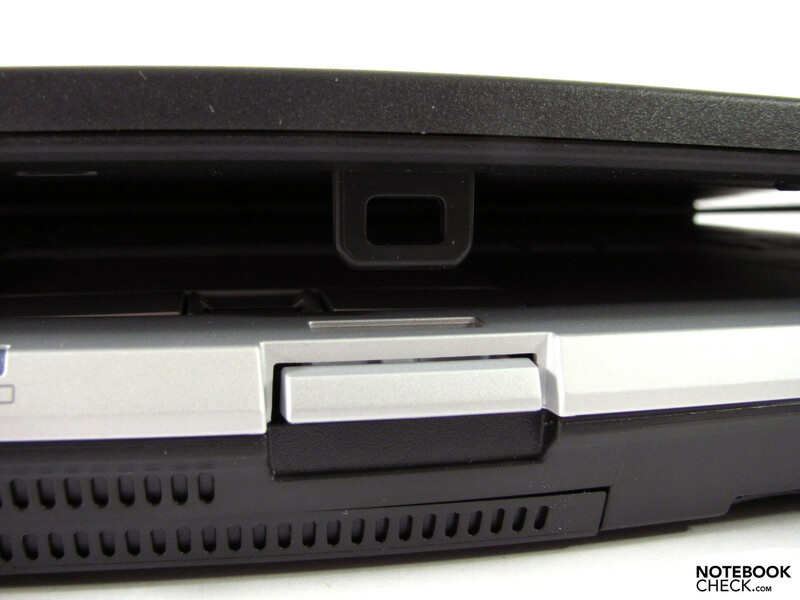 On the other hand, we were not impressed by some details such as the flimsy place holders for the ExpressCard and PCMCIA slots, as well as the innards of the laptop which can be seen when they are removed. It does not give a good impression and seems rather antiquated. This one could do without! The connectivity options are not perfect, but all the most important interfaces are covered. 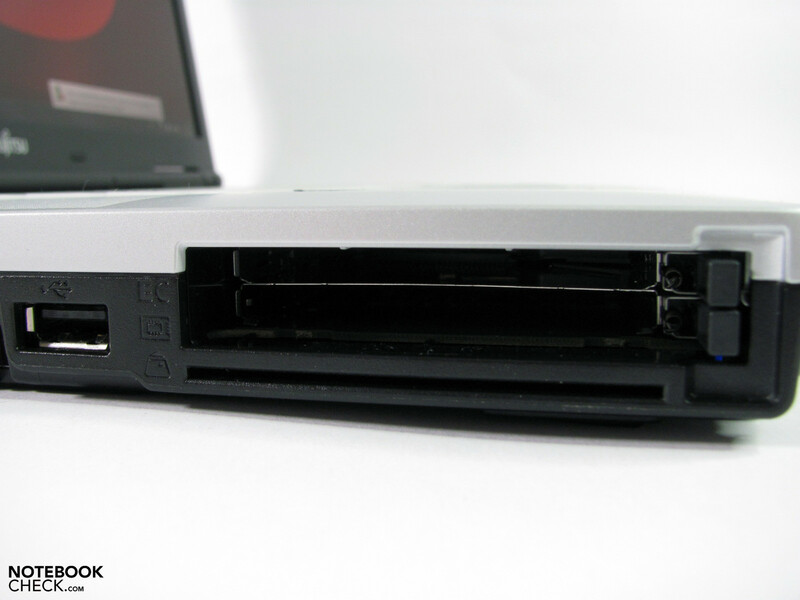 Gigabit-LAN, display port, VGA, USB 2.0, eSata, Firewire 400, one serial port, ExpressCard/54 and PCMCIA are all included. Especially the last two interfaces allow for a wide range of uses with both current and older forms of hardware accessories. 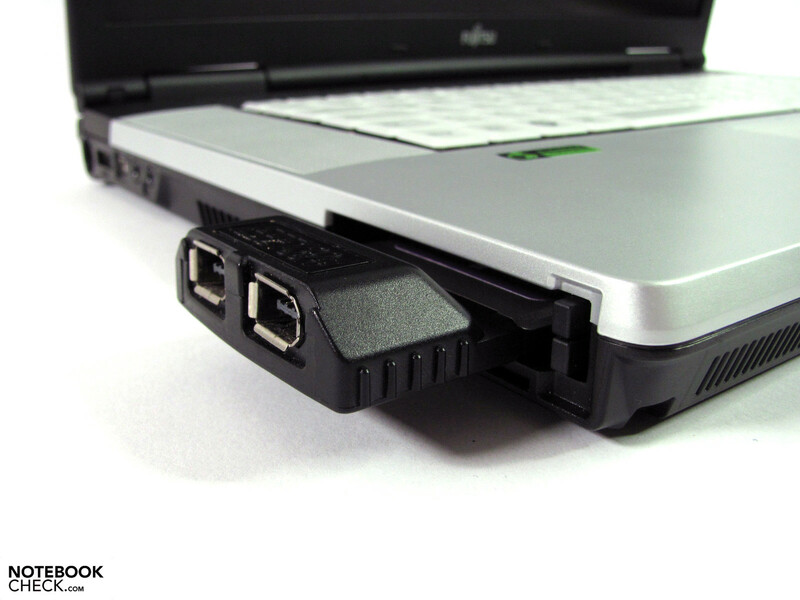 One could use these for USB 3.0, or additional features such as a TV Tuner or UMTS modem. 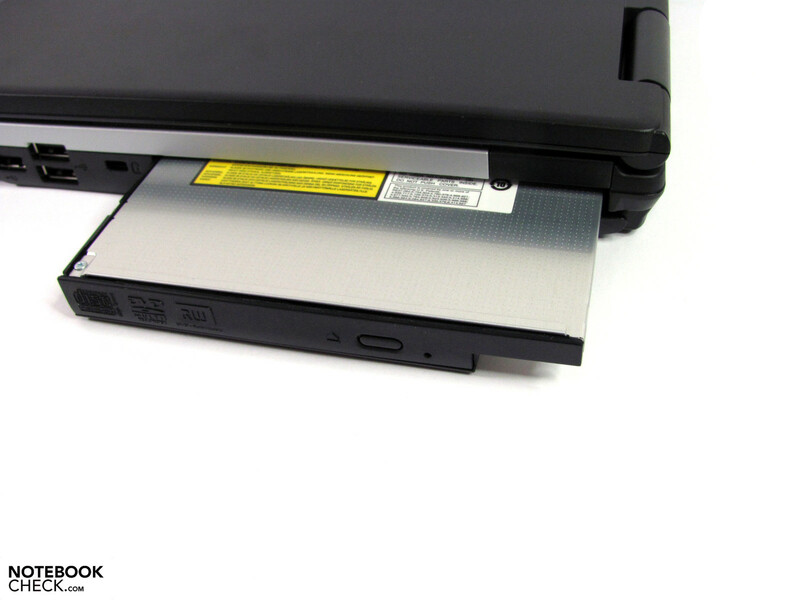 The PCMCIA interface provides the much appreciated opportunity to continue using any older equipment which one already possesses. eSata will be the connection of choice for external hard drives on this test unit as this provided the best data transfer rates in our test. The fastest rate we measured was 111,4 MB/s which is very impressive for a laptop and not even be reached by most external devices (except SSD). At this point one should make care to chose a hard drive with an additional power source as the test unit only comes with a regular eSata port and not an eSata/USB combination. 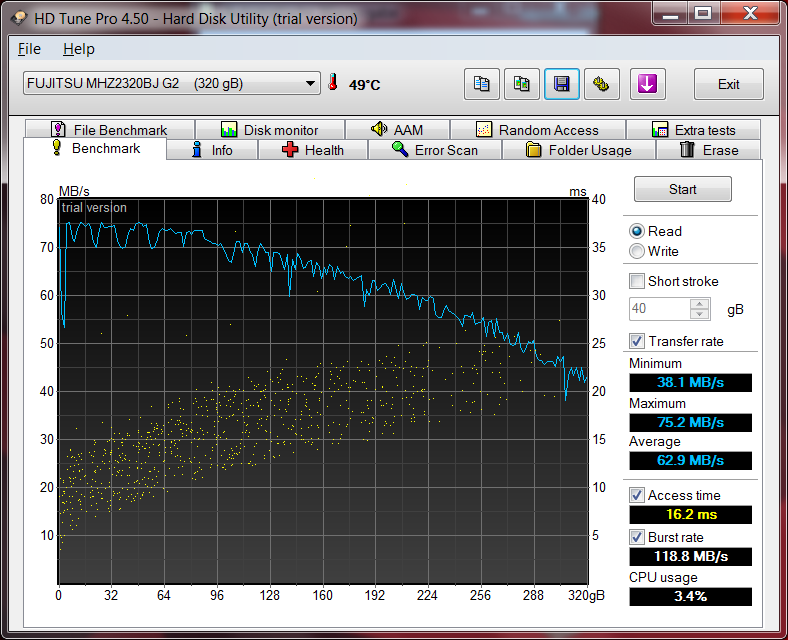 The transfer rate of the USB 2.0 and Firewire 400 reaches 31.2 MB/s and 35.6 MB/s. 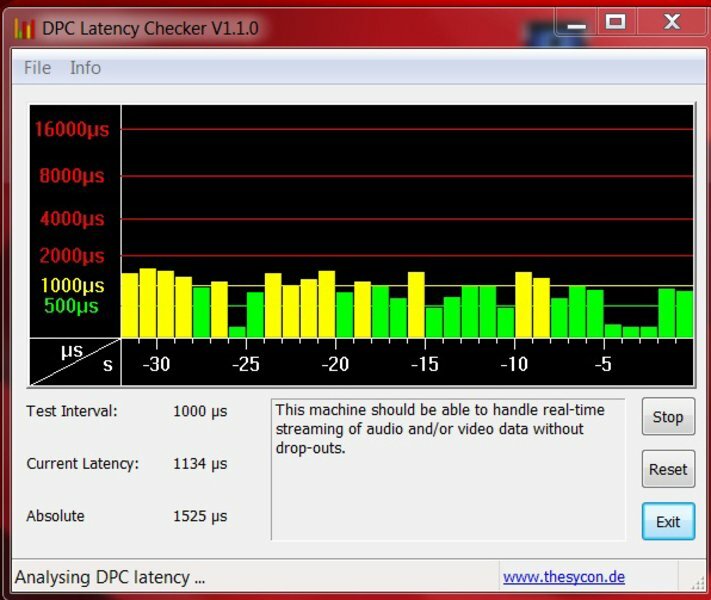 The USB 2.0 surprised us the most as it achieved speeds which we have never seen in any of our laptop test before. Very good! 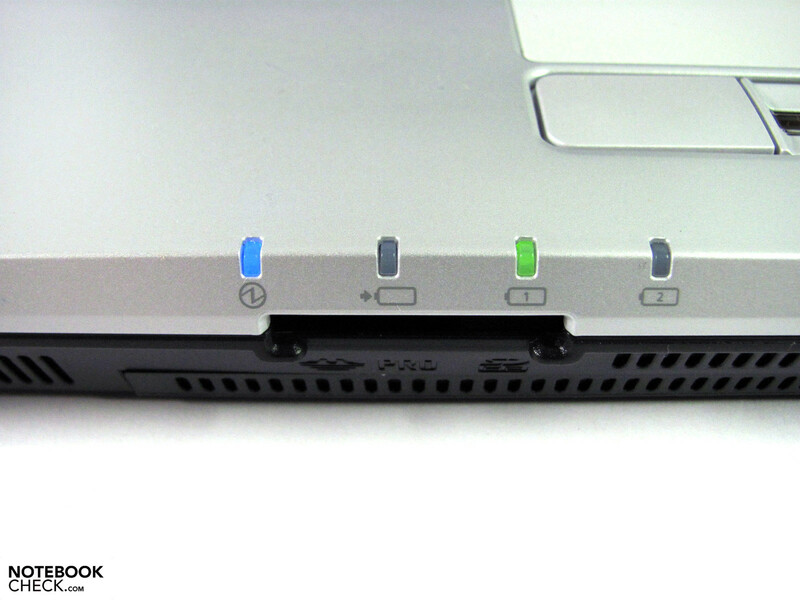 The 4 prong version of Firewire is used which means that it cannot be used as a power source. 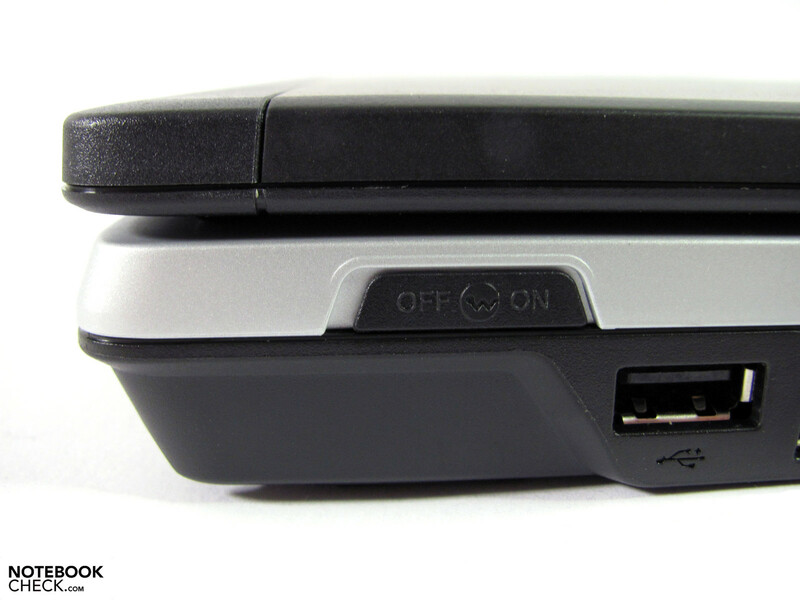 USB 2.0, on the other hand, supplies current constantly and can therefore be used to recharge external devices. As a whole, the positioning of the interfaces has been done very well. 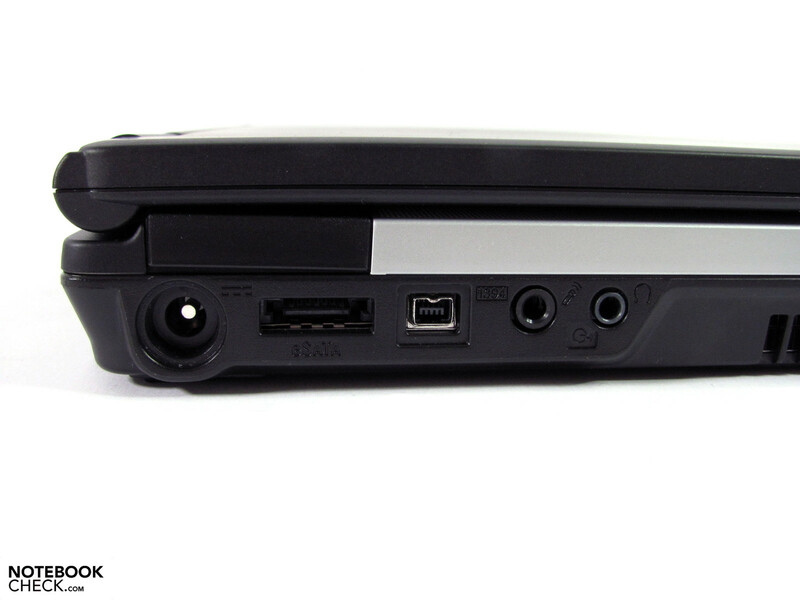 Only headset users may find the location of the audio port on the left hand side slighlty inconvenient. 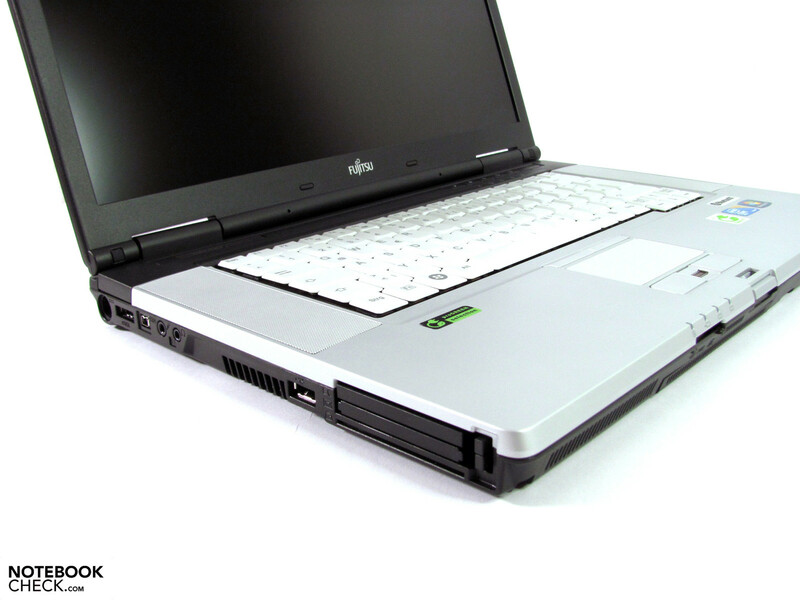 The interfaces which are commonly used when stationary, such as monitor ports and the LAN interface, can either be found at the back or located towards the rear of the laptop. 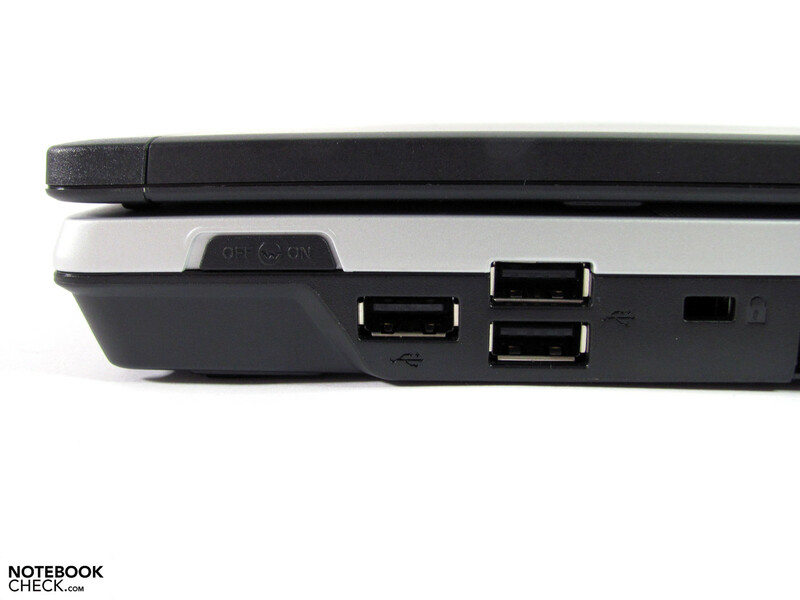 Although the three USB 2.0 interfaces are easily accessible (located on the right hand side), one will find that connected peripherals may get in the way of each other due to the lack of space between each interface. 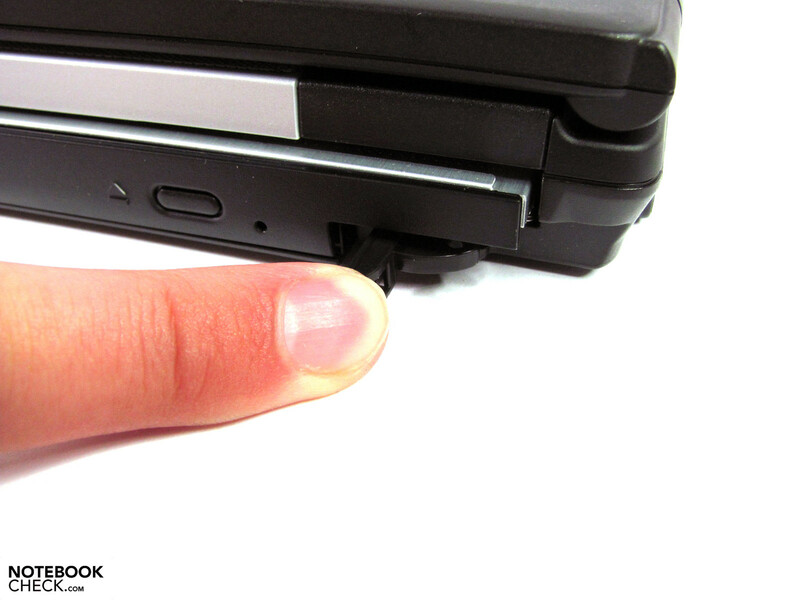 One can get around this issue by investing in some extension cables, but this won't help with the ExpressCard/54 and PCMCIA slots which in most cases will require the user to chose between using one or the other. 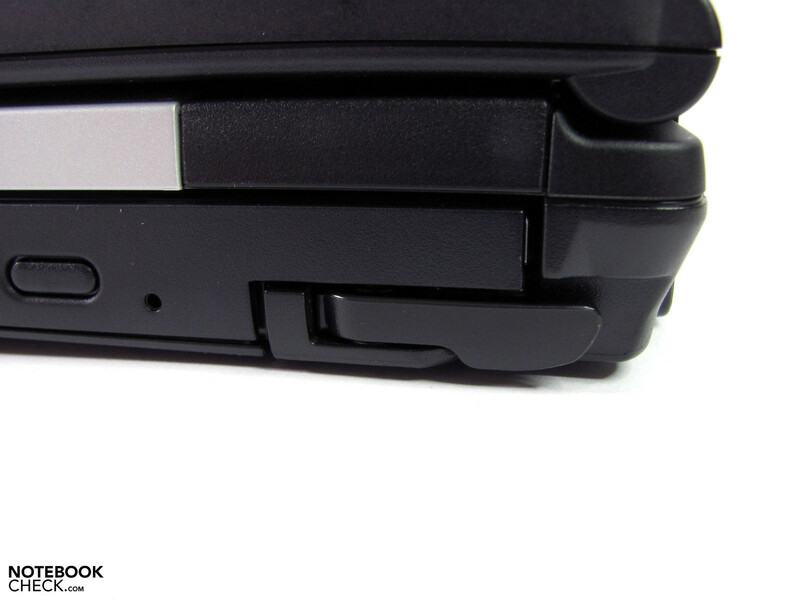 The use of both slots simultaneously is only possible with very compact peripherals as seen with some UMTS cards. Slightly lower down one will find the SmartCard-Reader which does not suffer from any restrictions. 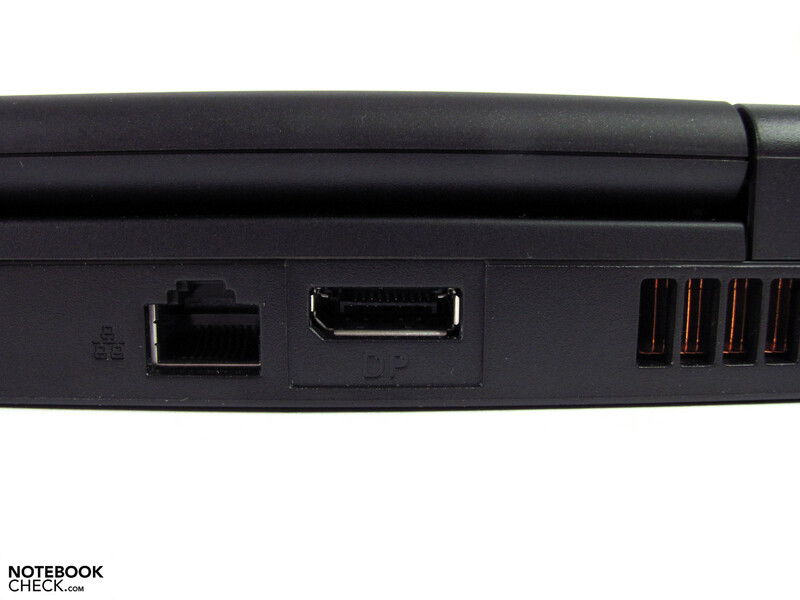 Fujitsu's docking station for the Celsius H700 is actually a Minidock which is connected to the docking port of the laptop. 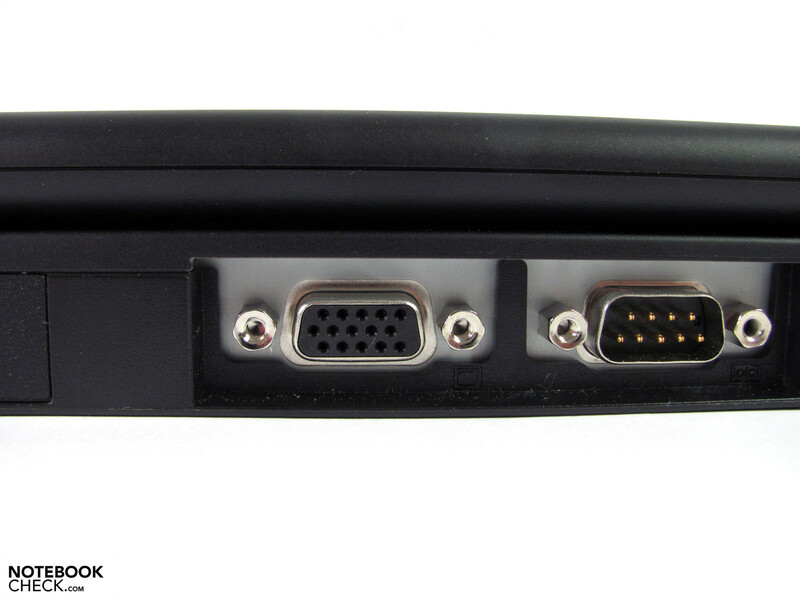 Besides offering the usual in- and outputs it also provides a Dual-Link DVI, display port and eSata. 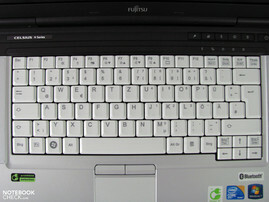 Price: The Fujitsu Online Shop has it for 190.- Euro. An additional battery (3 cells, 41 Wh), for the modular bay costs 200.- euro, while a 500 GB hard drive (7200 rpm) with caddy for the modular bay will set you back 140.- Euro. 5 years on-site support within 24 hours costs an additional 400,- Euro (only available within 90 days of the initial purchase). More details can be found on the manufacturers website which has all the general and product specific information (including accessories and options), clearly structured and with a good level of detail. 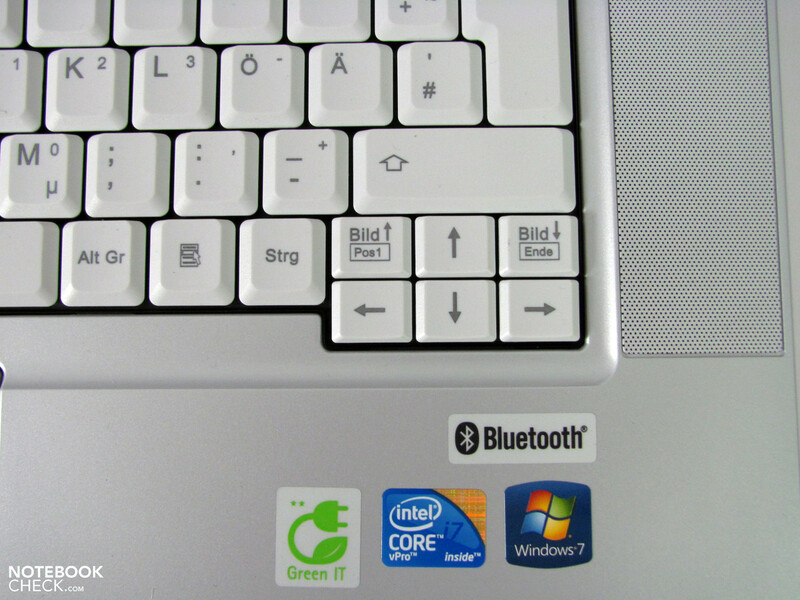 The keyboard of the Celsius H700 is equipped with a standard layout without any experimental features. 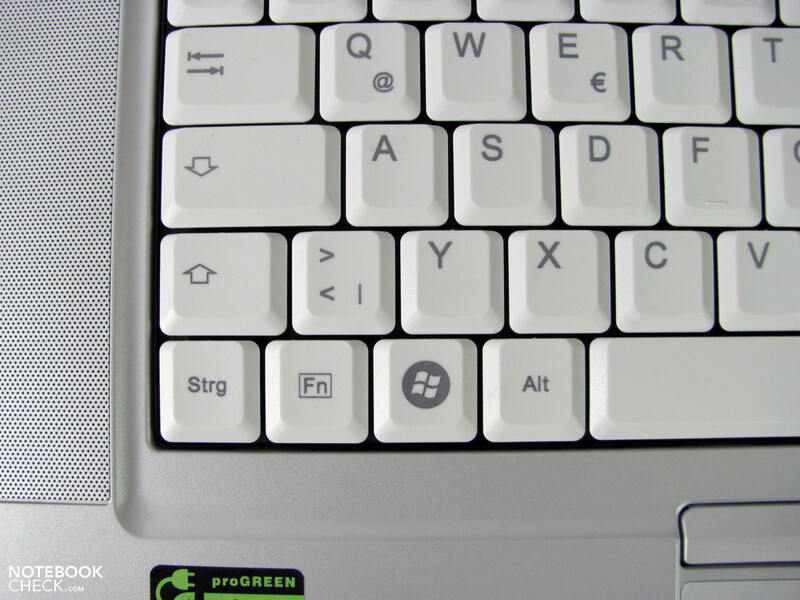 The arrow keys are nice and large, with the FN and Ctrl keys being in their usual positions. 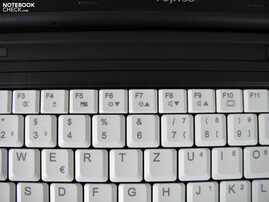 The FN key provides access to many useful functions. Although there would have been enough room for it, one has decided not to include a number pad which will come as a disappointment to those who enjoy a bit of number crunching. 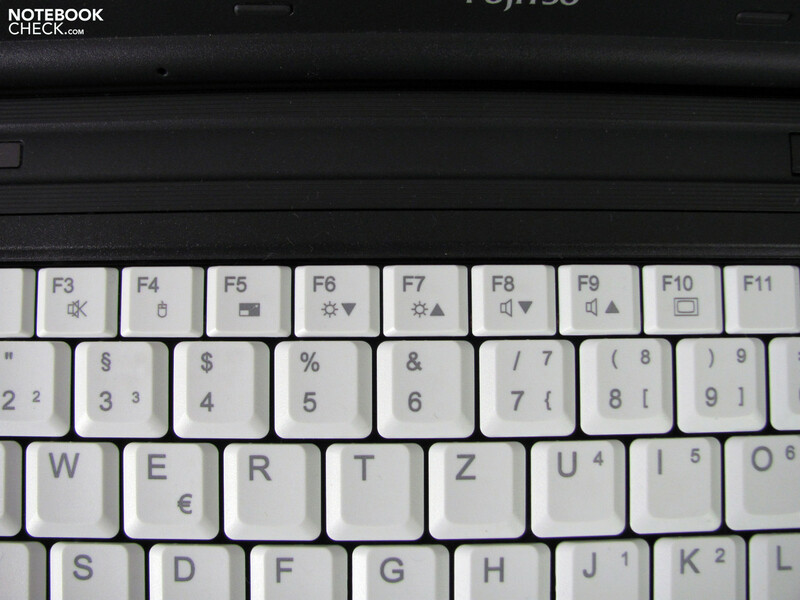 The low contrast between the lettering and the keys is also a bit unfortunate as this will make typing during poor lighting conditions more difficult. A backlit keyboard is not available. The rather mechanical sounding keystrokes might take a bit of getting used to, but are by no means unpleasant. The travel of the key stroke as well as the solid feel were very pleasing. Together with its other attributes, one must say that it definitely meets the standards required for heavy use. 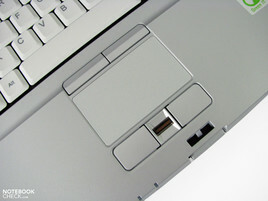 In its innitial configuratoin the touch pad is only equipped with a basic level of functionality. Functions such as zooming and rotating were not activated until we reviewed the settings. After that was completed, we found the touchpad to be very impressive. The input area is sufficiently large, it is well positioned relative to where the palms rest, it has a slightly coarse and tactile surface and registers inputs very accurately. 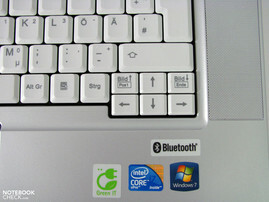 What is unusual, is that the touchpad comes with four buttons which can be configured with a variaty of functions. 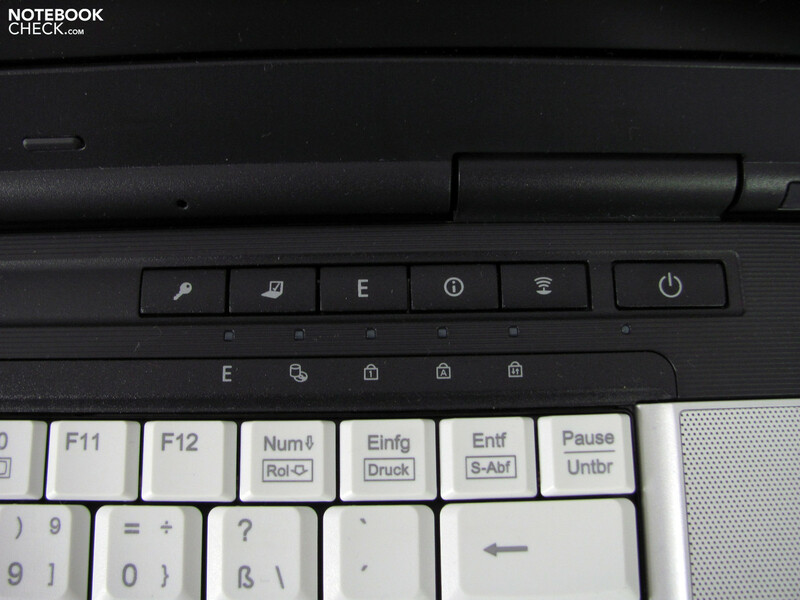 One could, for example, use the top two buttons to control the page scrolling. 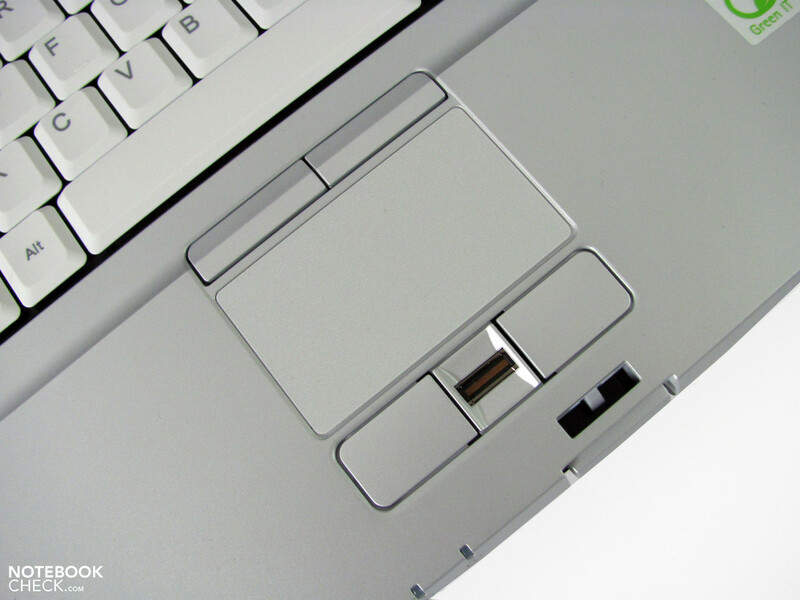 The various options can be selected in the Synaptics touchpad driver. 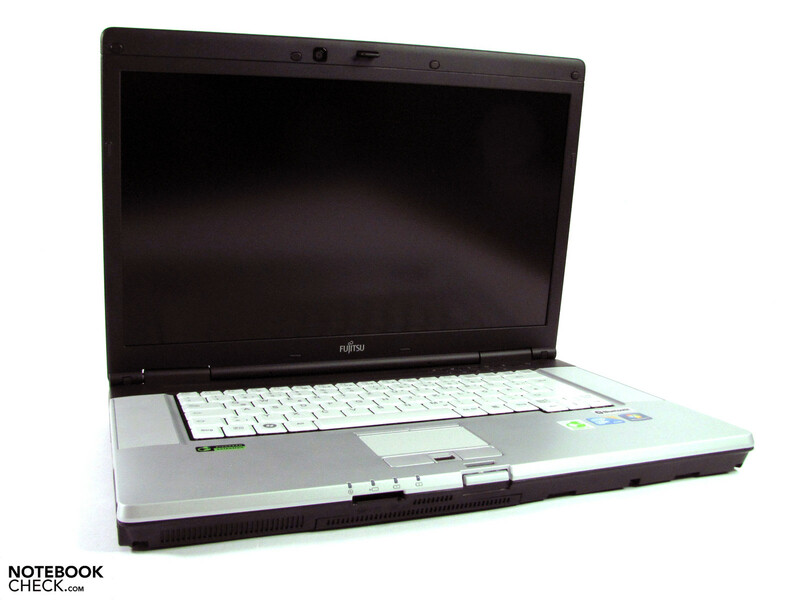 The Fujitsu Celsius H700 which we had was supplied with a 15,6“ Full HD Display, with a 16:9 format and a resolution of 1920x1080 pixels. The work surface provided on the screen is very large and looks great at 141 dpi. The generous proportions have the drawback that symbols and text appear relatively small. This can easily be adjusted in the screen settings. The 1920x1200 resolution in 16:10 format found in some Previous 15" models seems to be taking a while to phase out, and that does not apply solely to workstations. The highest level of brightness that we measured was well above average, going up to 343 cd/m². Combined with the other 8 measuring points we got an average value of 322,4 cd/m² and an illumination of around 83%. 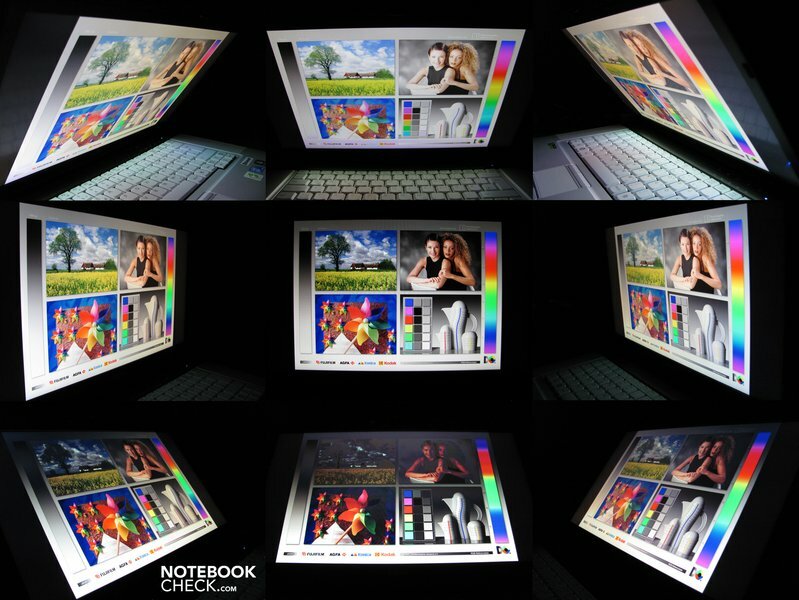 When viewing solid background colors there was no noticeable color fading towards the outer extremities of the screen, therefore creating no restrictions during everyday use. The brightness can be adjusted in 12 steps starting at 5 cd/m². We measured 101 cd/m² at step 4 and 134 cd/m² at step 5, which is generally enough when used indoors. The strong backlight in combination with a matt display panel turns the Fujitsu Celsius H700 into quite a performer when confronted with the great outdoors. The contents on the screen is always recognizable and even in direct sunlight the display is definitely better than average. Finding that we could also get full, unrestricted illumination while using the battery, was also a pleasant surprise. 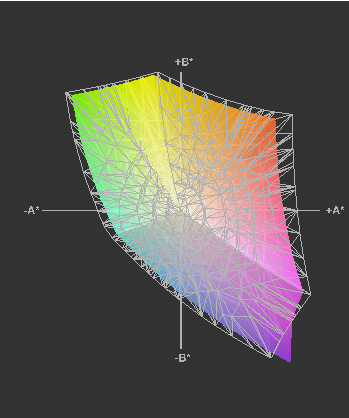 The display's color palette is much better than that of most other laptops but it doesn't quite manage to reach the full sRGB range, covering about 89%. It has an even longer way to matching the Adobe RGB color palette displaying 61%. The contrast on the other hand is around 680:1, which can be classified as "very good", as well as providing an excellent black image. The viewing angles are in line with the performance we have seen so far and can also be considered to be better than average. The vertical angles are limited, but on the horizontal plane images are clearly visible when seen from even the most extreme angles. We didn't see the extreme levels of color distortion that we did on screens such as the one provided with the Thinkpad W701 either. One will however see the usual changes in color and brightness that one is familiar with. 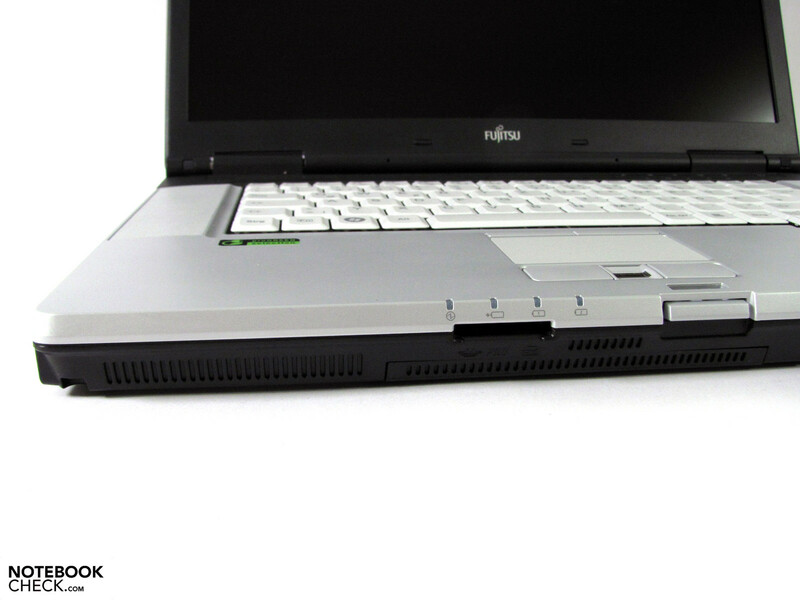 The Fujitsu Celsius H700 comes equipped with Intel's QM57 Express chip set as well as an Intel Core i7-620M CPU, Nvidia Quadro FX 880M GPU and 2 GB of DDR3 RAM. 320 GB of storage space is provided by a traditional, mechanical hard drive. The available RAM can be increased up to 8 GB using 2 (rather costly), 4 GB RAM chips as only 2 slots are available. The Core i7-620M CPU (2,6- 3,3 Ghz), which has been used in this application, is one of the fastest laptop processor on the market today. It reached 15th place in our comprehensive processor benchmark list. Itunes (being a single core application), managed to convert mp3 files into AAC format at 36.9x the normal rate, just falling short of the current record of 38.6x set by the Core i7-620M CPU in the HP Elitebook 8540w. 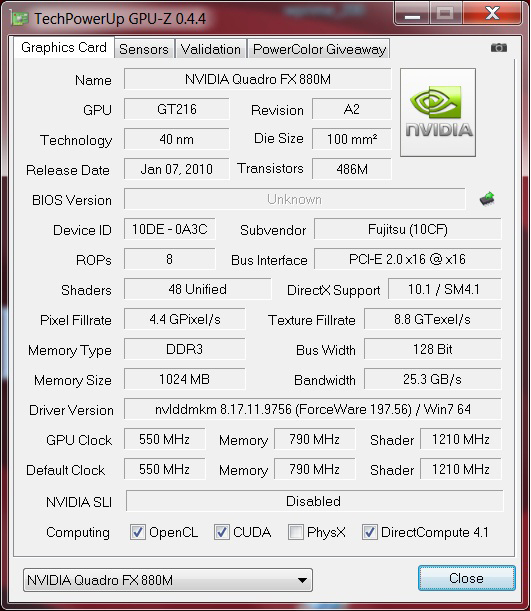 The Qaudro graphics card form Nvidia is supplied with the professional user in mind. 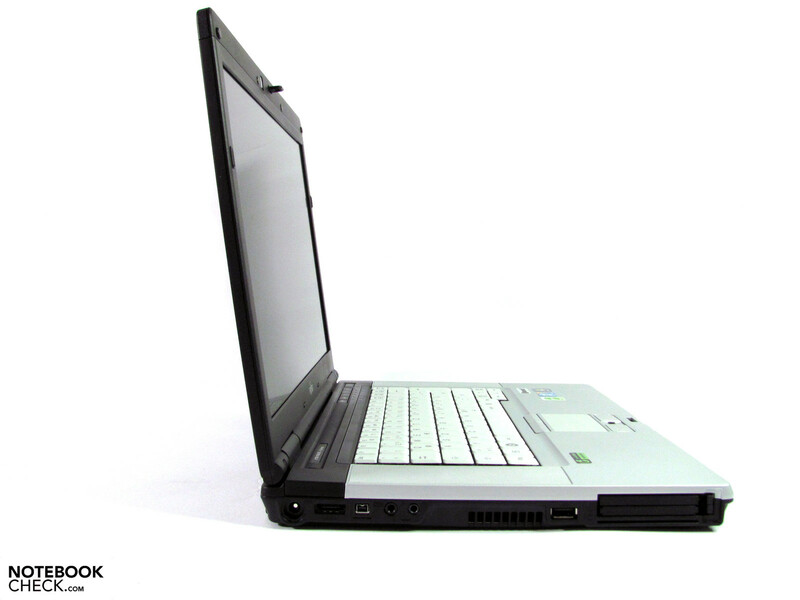 The Quadro FX880M is equipped with 1 GB of DDR3 memory running at 550 Mhz. What is special about this configuration, is the custom made driver, additional BIOS and comprehensive ISV certification which ensures that the interaction with the software works without any issues. 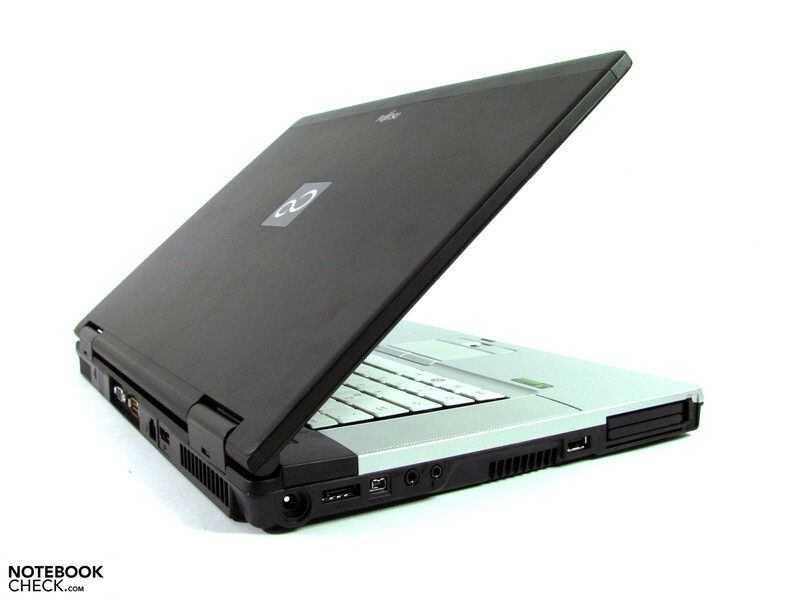 We could not find a list with further details on the Fujitsu-Homepage but we can assume that it is similar to that of the HP Elitebook 8540w. 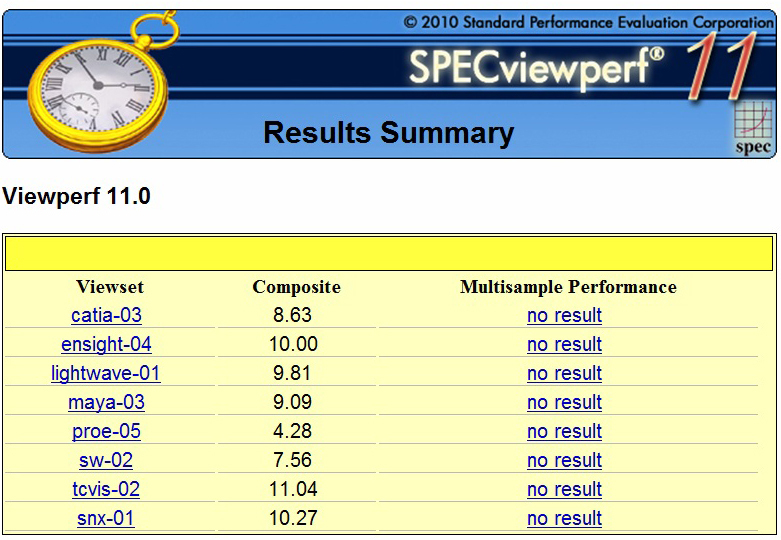 It is because of this, that besides our usual list of benchmarks we also chose to focus on the performance for professional applications using SPECviewperf 11 (see SPECviewperf graphics). 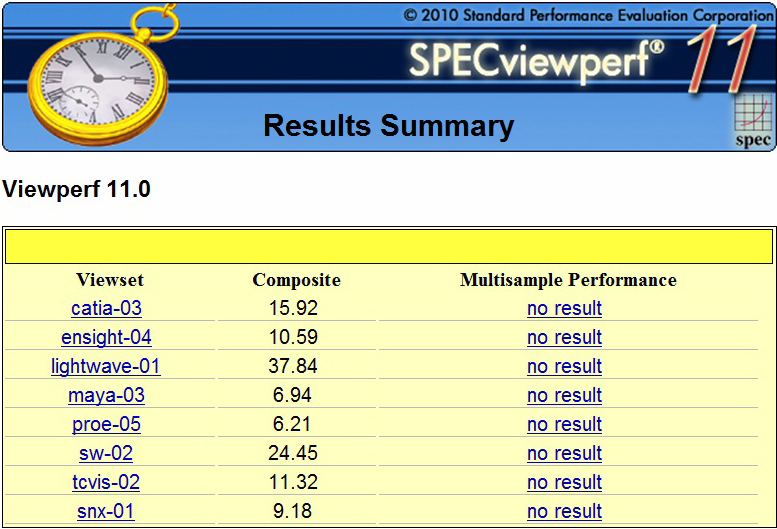 Here we noted that the performance varies greatly depending on which driver version is used. The Quadro driver which was provided (8.16.11.8798 from 13.11.2009), struggles to keep up with the version which is now available on the Fujitsu-Support page (8.17.11.9756 from 13.04.2010). The current version which is available on the Nvidia home page would probably bring further performance gains, but it could not be installed. Besides that, the results we got were as follows (tested using the drivers that were provided): 4130 points with the Cinebench R10 OpenGL Shading, 2644 points with the 3D Mark Vantage and 6392 points with the 3D Mark06. These scores were what we expected and underline a good level of performance. 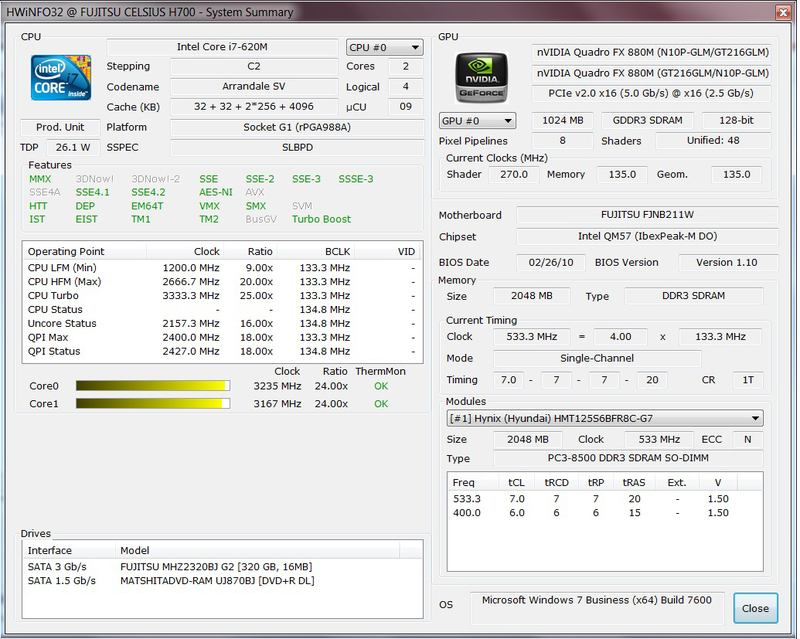 The CUDA cores can also be used for other tasks such as video conversions. The Badaboom software is particularly good at this which is why we like to refer to it every once in a while to evaluate a system's performance. With the Celsius H700 we achieved a frame rate of 78 fps while converting the film "Seven" into H.264 format with a resolution of 427x320 pixels (iPhone format). This results places the Quadro FX880M on the same level as the GT330M, and does not achieve the performance of the Quadro FX 2800M installed in the Lenovo Thinkpad W701. 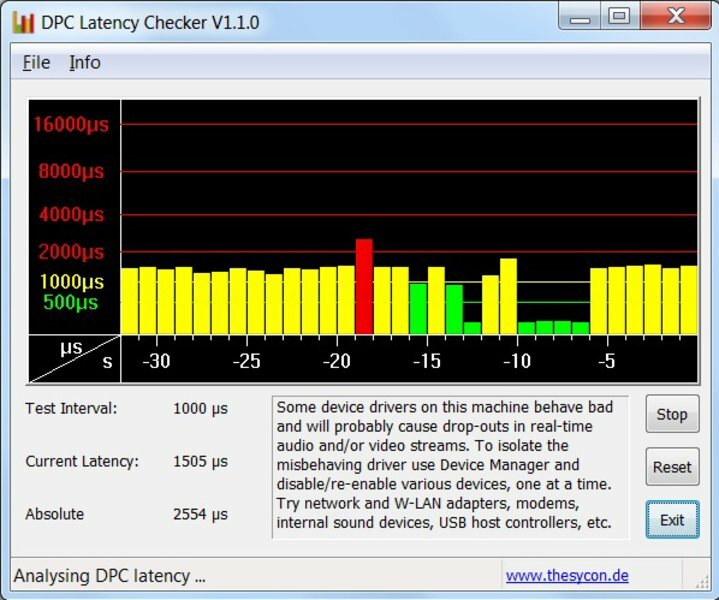 We checked the system for possible synchronization errors during the use of external devices with the DPC Latency Checker. While most of the fluctuations were not critical, after several attempts we did manage get one red indicator which we managed to link to the network adapters. Upon their deactivation, the results looked significantly better with in no further latency indications over 2000. Saying that the application performance is "very good" is not only a subjective impression. We put the system through several tests with programs such as Open Office, Photoshop Elements und iTunes resulting in an overall score of 7073 points using PC Mark Vantage. As is often the case, the bottleneck appears to be the hard drive, which despite its 7200 rpm can only provide an average level of performance. 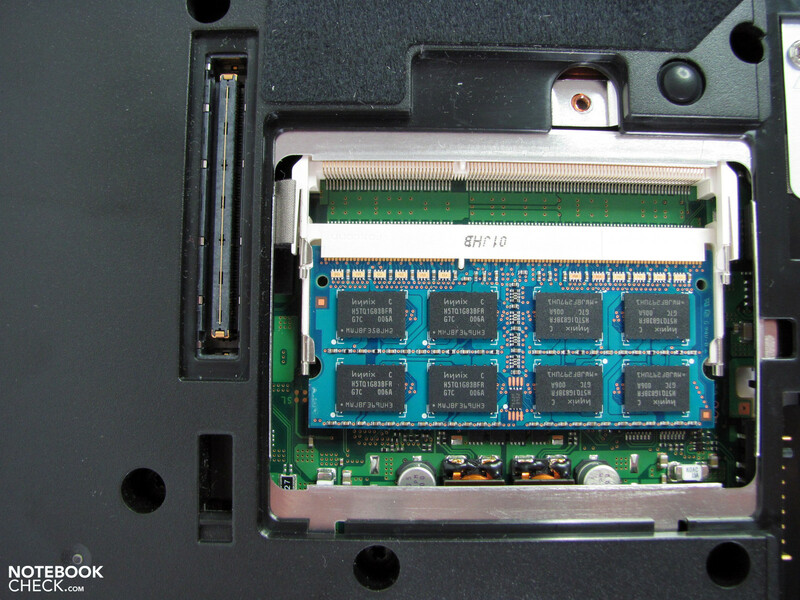 An SSD could bring a significant amount of additional performance. The storage space on this test unit was provided by a Fujitsu MHZ2320BJ G2 with 320 GB. It runs at 7200 rpm with 16 MB of cache. The average transfer rate is pretty average at 62 MB/s and is significantly less than others in its class. Depending on the application in use, we found that this, as well as the relatively small amount of RAM, slowed the system down a bit. Please refer to our comprehensive HDD benchmark list for further details. One should be able to see a significant improvement with an SSD or faster hard drive. There is also the possibility of installing a second hard drive or SSD in the modular bay as a replacement for the optical drive. We could not find the possibility for a Raid-configuration in the BIOS settings. Like many of its kind, the test units hard drive was equipped with a free fall sensor to prevent damage or a loss of data. 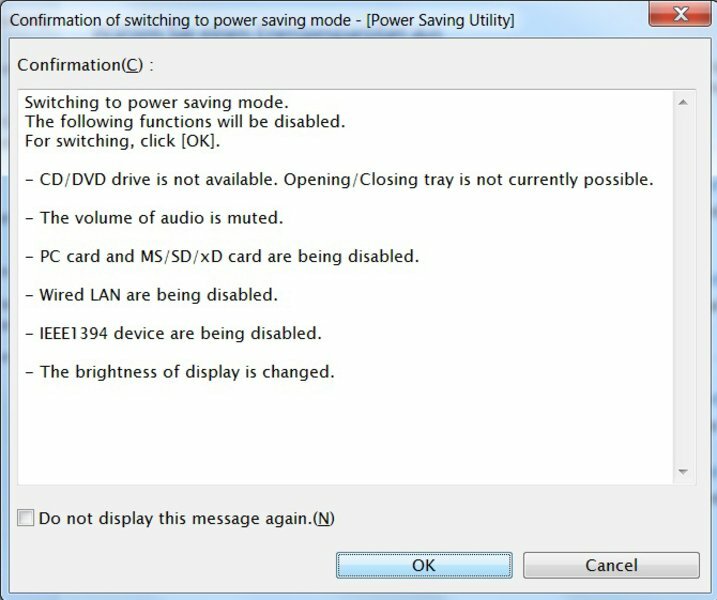 In this case it is so sensitive however, that even when switched to "normal" the movement caused by connecting peripheral devices led to a warning message in the task bar. This did not appear to affect the accessing of data during normal use. It is less sensitive when set to the mobile mode, which did not generate any warning messages. As far as games are concerned, the Quadro FX880M delivers roughly the same performance as the GT330M. We tested Starcraft 2 and Anno 1404, and came up with a good result. Even at 19 fps Anno 1404 could be played quite smoothly despite having everything set to "utra high". It wasn't until we tried the highest settings in Starcraft 2 that we managed the graphics card to buckle, turning the game into something more of a slide presentation. We did not check whether there was a difference in performance based on different driver versions. It is possible that this could improve matters. The impressive hardware specifications create a relatively large amount of heat which needs to be extracted. At 32.9 dB(A) this extraction noise is always present. For those who are relatively sensitive this will be too distracting while working on documents or browsing the internet. On the other hand, the noise characteristics are quite stable and are only disturbed by an occasional increase in rpm (35.1 dB(A)). 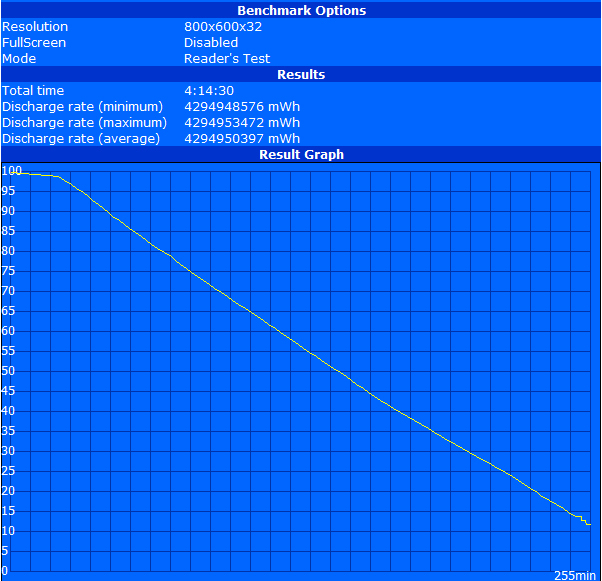 The hard drive gives off 35.6 dB(A), which is only noticeable during idle. A quieter model or an SSD would reduce this value. The DVD player registers an acceptable 36.1 dB(A), which is barely noticeable when playing a movie at regular volume levels. We measured 42.9 dB(A) when subjected to an intermediate workload. This covers most of the CPU intensive applications. In this condition it is clearly audible and it becomes irritating after a while. The highest level we achieved was 43.5 dB(A) when subjected to full load for longer periods of time. 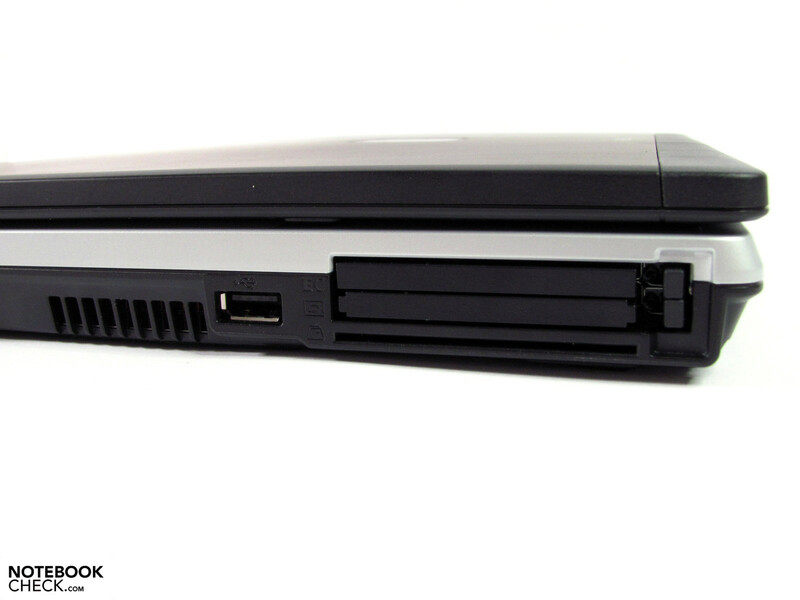 The BIOS offers the possibility to adjust the fan settings. Silent or normal are the options which are provided, but from a purely subjective point of view, we didn't notice any difference. The constant presence of the heat extraction has its benefits on the temperatures which are generated. Even after an hour under full load not one part of the case exceeded 40°C. We actually saw lower temperatures under these conditions than we did while under intermediate loads. This is because because the ventilation system allows the system to get warmer in order to reduce the use of the fan. Despite this, the values stay under 40°C and there are no temperature related issues. (+) The maximum temperature on the upper side is 34.4 °C / 94 F, compared to the average of 37.1 °C / 99 F, ranging from 23 to 69.8 °C for the class Workstation. (+) In idle usage, the average temperature for the upper side is 31.5 °C / 89 F, compared to the device average of 31.1 °C / 88 F.
(-) The average temperature of the palmrest area of similar devices was 27.8 °C / 82 F (-4 °C / -7.2 F). 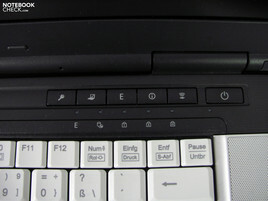 The speakers which are mounted left and right of the keyboard appear to be quite large - approx. 3.5 x 12 cm (perforated area), but produced an extremely poor qualitiy of sound. Most laptops can do better than this. Essentially the user only gets to hear the high note. The highest volume level is pretty average and is easily distorted making it only usable for system sounds. Headphones or a separate speaker system would be a significant improvement and don't have to be particularly expensive. 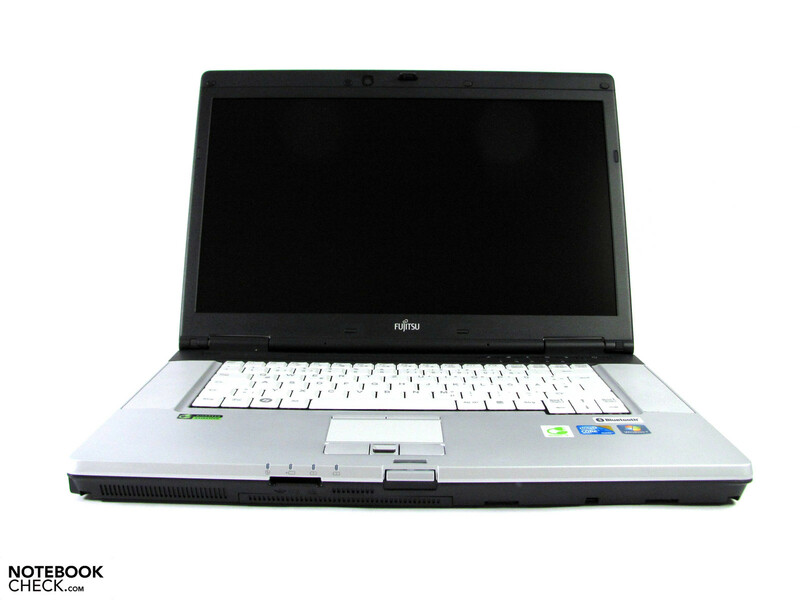 The Fujitsu Celsius H700 is supplied with a 84 Wh battery, with a claimed battery life of 5 hours. In addition, one has the possibilty of expanding this with a 41 Wh battery in the modular bay. The lowest power consumption we measured was 21.6 Watt which is in line with this potent hardware configuration. At idle the power consumption increases up to 28.6 Watt depending on the energy settings and which components are switched on. Under intermediate load (e.g. 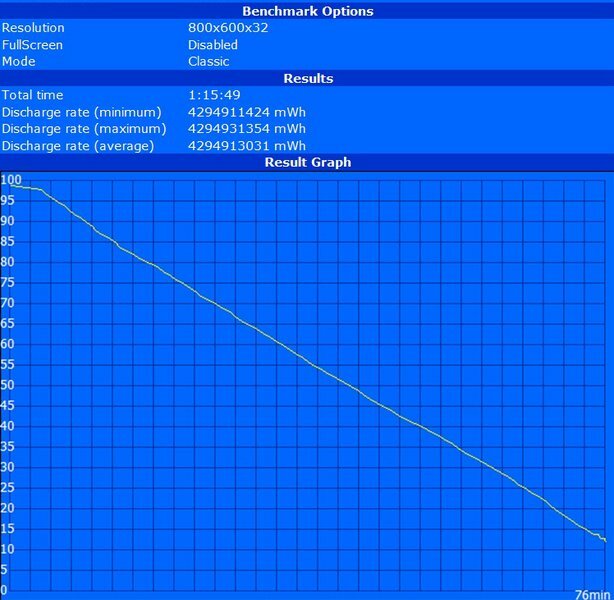 3D Mark06),we measured up to 65.6 Watt und the hightest level under load was 77.2 Watt. The battery life which we measured at the lowest level of consumption using the Battery Eater Readers test (longest possible battery life, additional components switched off, display on lowest brightness setting), was 255 min. If one switches on the W-LAN and surfs the world wide web with the brightness turned to full, one can achieve 189 minutes. DVDs could be watched for 172 minutes making it sufficient for a couple of movies. During the Battery Eater Classic Test (shortest possible battery life with everything switched on and at highest settings), the battery life was drastically reduced to mere 76 minutes. 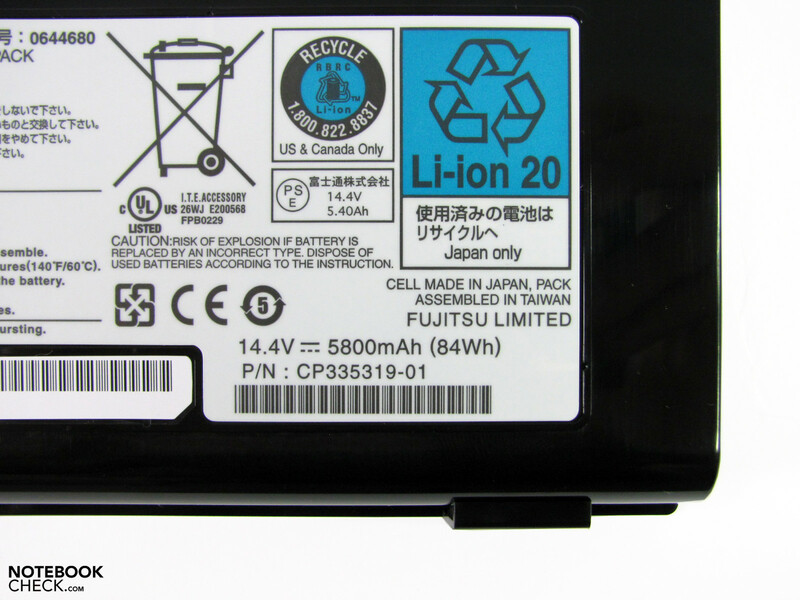 Based on its capacity, the additional 41 Wh battery should be able to increase the run time by 50%. We were not able to test this however. 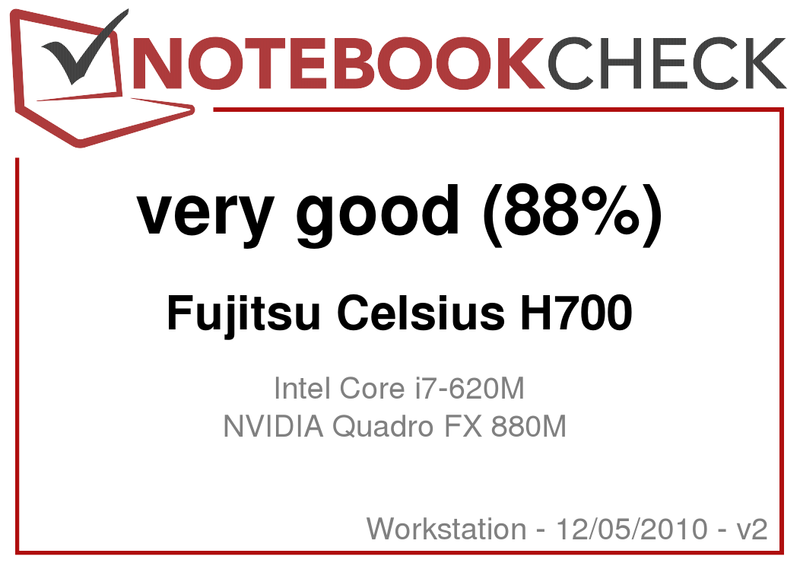 The Fujitsu Celsius H700 is definitely not a "looker" and disappoints as far as the materials and some rather poorly executed details are concerned. Although these issues are largely based on personal preference, there are some things which are not. This includes the constantly audible fan, the average performance of the hard drive, and the small quantity of RAM. At least the last two items can be solved by oneself, quickly and easily. The graphics card driver is not optimal either. The one on the nVidia support page cannot be installed and it is not yet available on the Fujitsu website. This is irritating as there are potential performance gains to be had. The workstation does score well when dealing with its core functions. Despite the driver issues the system performance is very good overall and performs most tasks with ease. 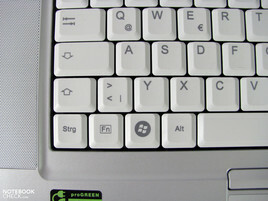 The keyboard is good for intensive use and the touchpad surprises with some individual gimmicks. 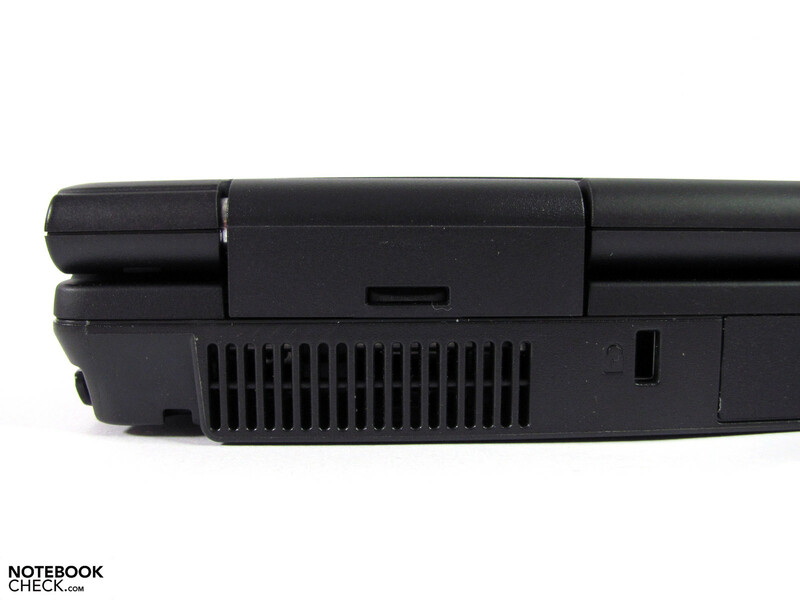 The casing is stable and robust, and includes many, well positioned interfaces. 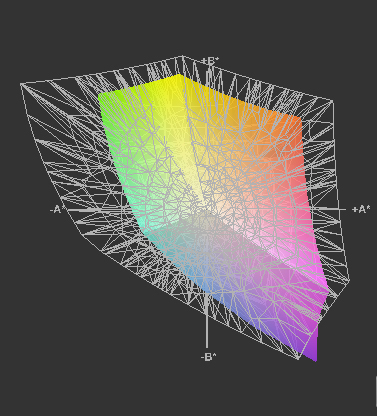 The display might not support the sRGB color pallet but can still impress with other good attributes. 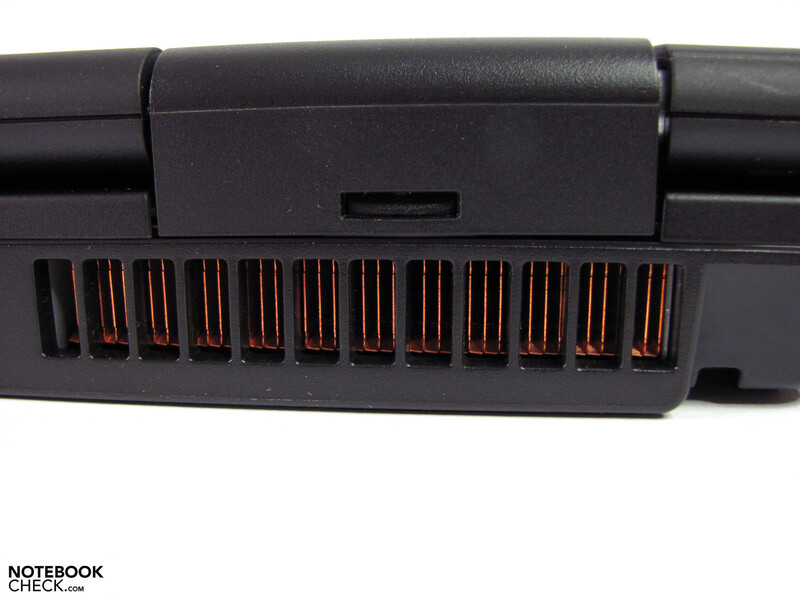 The battery life is acceptable and it can be extended with the use of an additional battery in the modular bay. To summarize, this package is easily upgradeable, comes with a 36 month warranty and represents a previously unattained level of value for money. 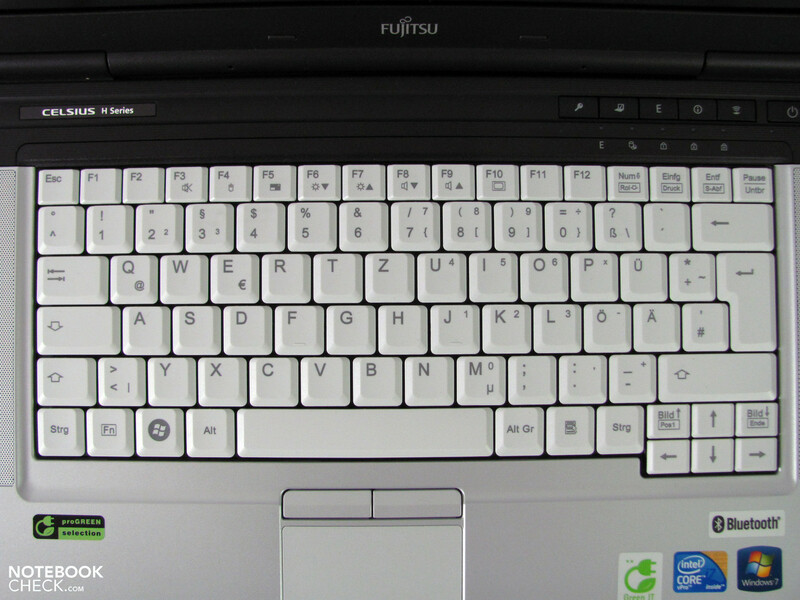 ...the lightly colored keyboard may fade quickly through rigorous use. The overall impression is pretty sleek, but it still weighs almost 3kg. 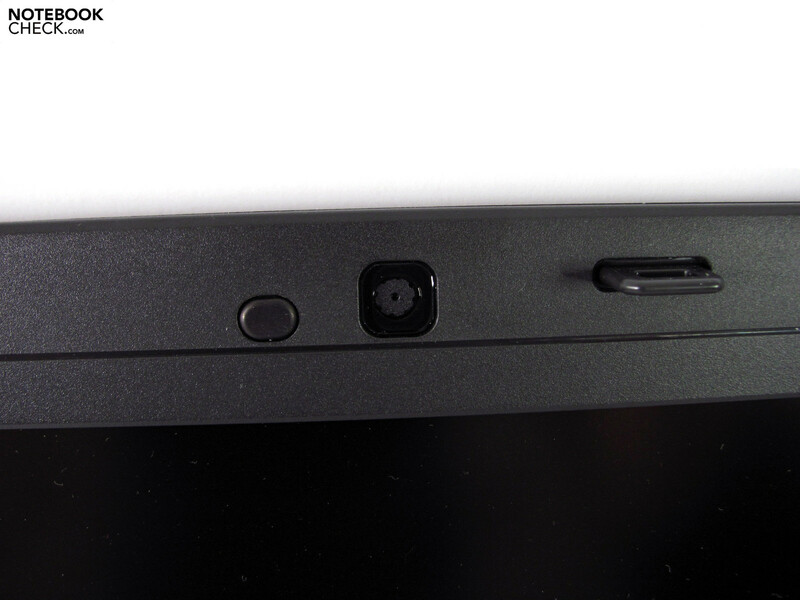 The webcam is sufficient for "Skyping"
- Hard drive and RAM specifications are not in line with the other specs. 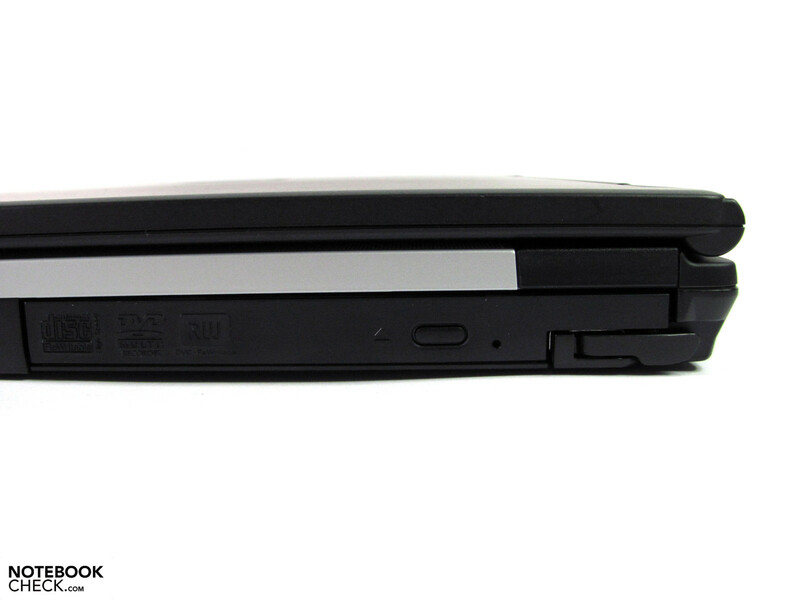 HP Elitebook 8540w, Lenovo Thinkpad W510 and Dell Precision M4500.